Alright, I'll admit: I've made this one before. But when I have the ingredients on hand, I really can't resist the combination. 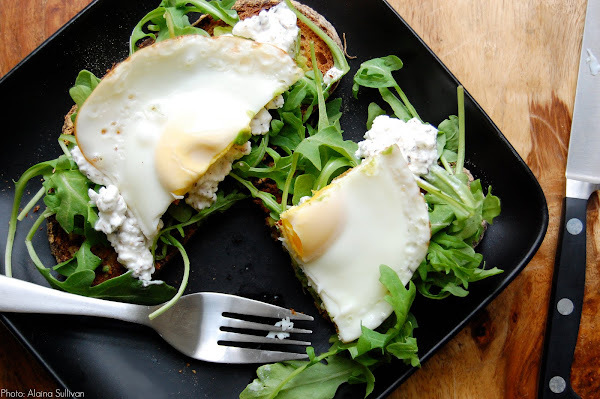 I've done countless tweaks on the original, which at its core features a combination of greens, a creamy cheese (cottage or ricotta) flavored with thyme and a fried egg. The ever-buttery avocado made its debut in this version, painted on the face of toasted whole-wheat sourdough beneath a bed of arugula, cottage cheese & thyme, and a fried egg. A fork-and-knife kind of sandwich.